In a country where 10 per cent of the people garner 80 per cent1 of the country's wealth, 70 per cent of India's population lives in the rural areas, which are marked by low literacy rates, lack of proper sanitation and medical facilities and inadequate growth opportunities. India has constantly remained in the cross-fires of cruel comparisons - the second fastest growing economy that yet hosts 22 per cent of the world's poor, is also the second most populous nation in the world. In a country where 10 per cent of the people garner 80 per cent1 of the country's wealth, 70 per cent of India's population lives in the rural areas, which are marked by low literacy rates, lack of proper sanitation and medical facilities and inadequate growth opportunities. In the absence of growth opportunities, which has led to more than one-fourth of India's rural population being poverty struck, the situation is further worsened by localised wealth accumulation by middlemen and by political clout. As per a report by a financial daily, about 44 per cent of rural households and 33 per cent of urban households still do not have a bank account. While NBFCs have emerged as an effective provider of credit to the less-penetrated regions, unorganised lending still occupies a huge share of credit in rural India. In the past, this has resulted in lending at high rates of interest followed by coercive collection practices leading to suicides and increased borrowings to repay the existing debts. In a country that chased consumerism in the early 2000s and then chided capitalism post the 2009 financial crisis, financial services has often been the antagonist, blamed and blunted by all and sundry. Interestingly, it is the same bad-mouthed sector that came to the rescue of rural India, in the form of micro-finance institutions (MFIs) that today operate with the business model of lending small amounts of money for short periods with frequent repayments to minimise the portfolio at risk. However, like most of its well-bred brethren, MFI wasn't spared its trials and tribulations either. From a pre-2009 era of being viewed as a divine messenger, various debacles within the system, bad governance and farmer suicides in Andhra Pradesh2 led the sector to be seen more like a mafia than a messiah in the years to follow. However, the past few years have seen a resurgence of this lending platform. And given that eight3 well-oiled MFIs are now on the road to become small finance banks, the buzz around the sector is unmistakable. What then goes into the making of an MFI? Is it really geared up for growth? Can it attain (and sustain) the dizzying heights through its sustainable talent model? Mafia, Messiah or Mirage, can the sector keep away from the temptations that the banking sector fell for, and never recovered from? With a fairly broad-based portfolio distributed across agriculture sector lending and social lending, the gross loan portfolio of MFIs in 2015 grew to Rs 40,138 crore (a y-o-y growth of 61 per cent) with more than 30 million borrowers (a y-o-y increase of 29 per cent). Today, MFIs are spread across 32 states / union territories (489 districts) with a network of more than 10,500 branches. For every employee, there are about 330 active clients; average loan size being Rs 13,000. 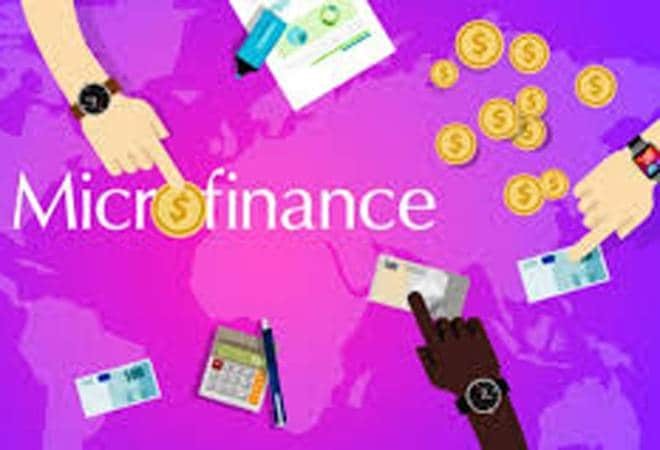 By the end of 2015, the microfinance industry's average outstanding loan portfolio per field officer was Rs 0.81 crore. The industry is also focusing on providing financial literacy to the poor and encouraging savings and insurance among the people at the 'bottom of the pyramid'. Given the projected growth rate of 24-30 per cent over the next five years for MFI in India, there needs to be increased focus on governance, risk analytics and quality sourcing. While prima facie recruiting the right number of people appears to be the issue, the bigger challenge lies in retaining and developing the talent to meet the changing needs of the industry. On the structure, typical number of levels prevalent in the MFI space is eight as opposed to 10-12 in case of NBFCs and banks. 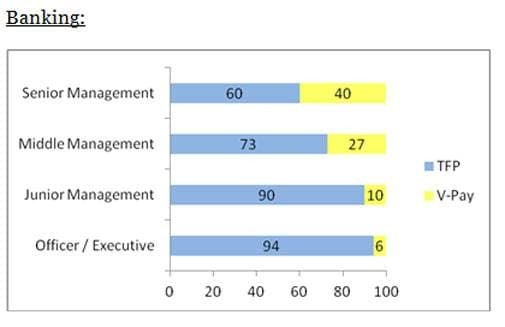 This is largely on account of a gap in the mid-management levels - people graduate from a divisional manager (managing multiple branches / cluster) to a zonal manager (managing either N, E,W,S zones) as opposed to a bank / NBFC where there is a prevalence of state / multiple state heads acting as span breakers. The other reason being attributed here is that the sheer business volumes creates the need to have more span breakers in case of NBFC / Banks as compared to much lower ratios in MFIs. The average expense per employee is significantly lower for MFIs at 0.6 times that of NBFCs and 0.5 times of a bank at the entry levels. Interestingly though, the salaries at the field / credit officer level are comparable with the NBFCs, which presents an opportunity to look at a greater talent pool which has prior experience in a customer facing role. However on total pay the analysis shows that over years while NBFCs have caught up with banks, for MFIs it's a long way off given their differential is greater than 50 per cent across most levels. While both NBFCs and banks have a strong long-term incentive programme, most MFIs have not explored this option other than the well-established ones looking at transforming into a bank. While fixed pay should be set high enough to provide employees with the economic means to meet their basic living needs, performance-based pay should ensure that the talent within the organisation rises up to the need of the hour. While the social calling remains for many at the senior management level who have moved from more well-paying arenas, if MFI has to attract the right talent across junior and middle levels, the pay needs to be reasonably competitive. On the pay mix, banks exhibit the most aggressive picture across senior and mid-levels, where there is a strong prevalence of LTI (in the form of ESOPs and SARs). NBFC's have been fairly aggressive in the mid and junior management levels where they offer higher cash based incentives and are often successful in drawing talent from banks as well as MFI's. The aspect of performance-based pay is often missing in the MFI world and a large part of this is more of a committed bonus than having a strong linkage to the individual's performance. While there are evolved firms who have strong sales incentive plans, the payouts as a percentage of fixed is 25-35 per cent. On the benefits front, it is observed that the MFIs lag significantly as compared to NBFCs and banks. They continue to be driven largely by basic and mandatory benefits than focusing on more lifestyle / wellness counterparts. Benefits like company provided vehicle, club memberships and wellness packages, find greater prevalence across most Banks and established NBFC's. MFI's with a relatively different talent set don't need many such benefits and their policies revolve more around the mandatory ones like PF, gratuity, leaves and socially dependent schemes of Insurance (Health, Life and Accident). Signalling also comes into play as somewhere the growth and profitability objectives of MFIs get shadowed by the social purpose of existence of MFIs. Thus the talent attracted by the sector is perhaps not the most competitive. 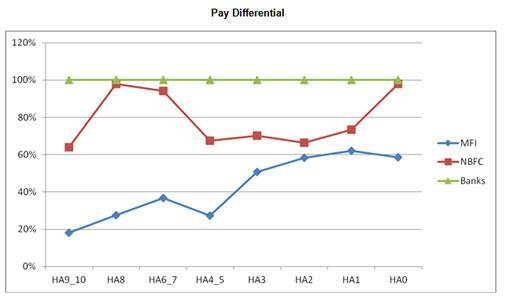 One of the ways to make the industry attractive is by improving the pay positioning across the sector. Fixed pay should be set high enough to provide employees with the economic means to meet their basic living needs. This should be supported by appropriate variable pay plan (for non-sales) and sales incentive plan (for sales force) while placing appropriate checks and balances to discourage mis-selling. While most of the MFIs do not have a formal target setting (KPIs) / performance evaluation process, the need of the hour to enable this strong linkage between pay and performance is to have a PMS established and practised. While pay is one of the factors that affect the quality of talent attracted by the MFIs, location is another factor that works against MFIs when it comes to attracting talent due to their increased focus on rural and remote rural areas. Add to that increasing competition in the industry, and the result is high levels of attrition at the junior and mid-management level. This further compounds the problem of finding 'relevant' and 'ready' talent. There is a significant difference in the competencies required at the entry level to operate in a rural and remote rural setup (as compared to urban or semi-urban setup), which has remained unaddressed till now. While the difference is partly due to the demographics, there is significant difference in the operating model as well with the number of touch points in MFI being higher than that of NBFCs. Touch points in this industry include performing village surveys prior to entry, interviewing potential customers, providing training on financial literacy, credit administration and repayment, and travelling to villages for collections once a week. As we progress up to the middle management level, the focus needs to shift on managing complexity and ambiguity. 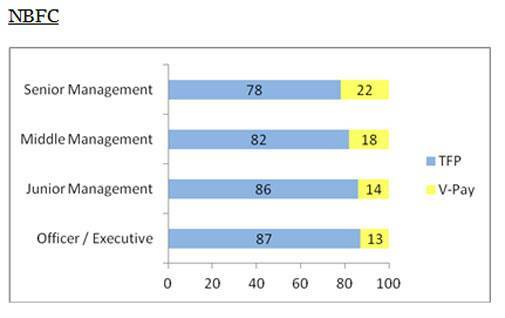 Today, the middle management either has skip-levels or vacant positions in majority of the MFIs primarily due to their inability to retain talent. 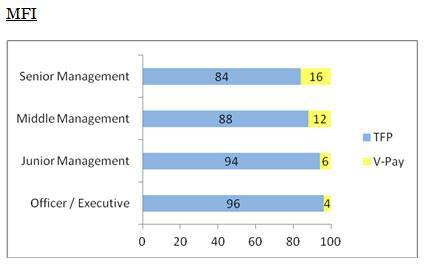 Typically at the level of an area manager who is responsible for a significant portfolio size and has managerial responsibility of 100-200 employees, MFIs have continued to hire graduates from rural management schools who are deployed in such managerial positions without allowing them the required time to gain relevant field experience and maturity. Since the MFI industry is challenged at times by political agendas at the local level, the middle management needs to be capable enough to deal with uncertainty and handle short phases of crises. Their maturity level, understanding of the socio-economic factors and relationship building ability can change the power dynamics in favour of the MFIs. Hence, competency assessment and development through proper training should be a focus area for MFIs across levels with emphasis on the relationship management, decision making, problem solving, and communication skills but in a fairly unorganised scenario. With the advent of the Small Finance Bank License, the pay and benefits of MFIs have witnessed a change. To be able to facilitate the transformation journey and aspirations of becoming a unified / full service offering bank, MFIs are looking to hire a different set of talent that is more aligned to the banking world. While most of the licence awardees are banking on technology to be a game changer, there is still a strong need for talent who can lay down the framework especially from a regulatory perspective and as a result, compliance and control function roles are one of the first talent sets being poached from most Indian / MNC banks. The other talent set that has seen huge demand is people capable of branch banking and liability sales. This is one part of the business most MFIs turning SFBs would look at beefing up given the immense opportunity to create the delta in their cost of funds. With a more evolved set of talent coming onboard, the licence awardees are focusing largely in an HR transformation journey to be able to attract and retain banking talent in the long run. Women empowerment in India requires a crosscutting approach that addresses the diversity of social structures that govern women's lives. Today, women account for more than 48 per cent of the population of India. However, there is significant disparity in the economic opportunities available to women in rural India. While policies on women empowerment exist at the national, state, and local levels, there are significant gaps between policy advancements and actual practice at the community level. One of the key objectives of the MFI industry since its inception has been to provide women with opportunities to improve their livelihood. The industry has continuously focused on providing financial literacy to women of rural households and encouraged savings and insurance among them. About 70-80 per cent of the customer base for MFIs today is women with a repayment rate of about 95 per cent against repayment rates of about 70 per cent for middle class men who form the primary borrowers for commercial banks. This explains why the industry has continuously focused on women borrowers and should continue to keep doing so. With a majority of the borrowers in rural households being women, this industry presents a strong case for revisiting the gender gap among the workforce to foster stronger relationships with the customer base. Since rural women have traditionally worked at significantly lower wages, employment on par with their male counterparts should not only boost their self-esteem but also drive higher productivity levels across the workforce without raising wage costs. Greater inclusion in the workforce should also provide self-reliance to women by reducing their dependence on other members of the family and motivate them to improve the livelihoods of other women in their villages / towns, which surely are one of the key purposes of existence of MFIs. The MFI industry today is in the midst of a radical transformation that aims to take the socially driven sector out of the throes of mediocre management to a professionally plying, well governed organisation. The larger message of financial inclusion, the overlying culture of cooperating communities and the perennial pursuit of perishing poverty needs to remain at the core of how these institutions function and achieve their greater goals. But given their arduous task and with the industry on an exponential growth track, the next big question is whether today's talent has the ability to support and sustain tomorrow's growth. Can diversity be the game changer that will create a new chapter in the seemingly parochial world of financial service and create new talent paradigms? And with the regulations coming in around the capping of interest rates, the only way forward for these MFIs would be to rationalise the talent cost, which today is on an upward spiral. It is perhaps time that MFIs also adopt similar methods employed by their near and mature cousins - banks and NBFCs - be it base-lining pay and pushing performance, or managing talent in the true sense. There is a lot for this upcoming sector to learn from the larger industry, more so how to not fall prey to all that glitters, and remain true to the cause that drives their existence in the first place. Perhaps there is a middle path that brings in organisational maturity yet does not deviate from the goal that Muhammad Yunus had set out for MFIs many years ago in neighbouring Bangladesh.